“I was once a member of the Pregnancy Club, my membership card consisting of two pink lines on a stick. I was eager to pay my dues, just like all the other members. Morning sickness, stretch marks, cravings — I welcomed them all. Miscarriage is a terrible word. As if one has dropped something, or carried something incorrectly. Similar to “mistake” or “misunderstanding.” How I longed for it to be either of those things when I learned my baby was gone. Surely, it was a mistake, I prayed. If they would just look again, they would learn it was all a simple misunderstanding. 1 out of every 5 pregnancies ends in miscarriage, say the books. That statistic terrified me when I was pregnant. So many lost babies, I thought. How can I keep mine from being one of them? But now that mine is one of them, that 1 out of 5 seems awfully small. Or, at least, it did. Until soft-speaking female voices started whispering to me in my grief, “It happened to me, too.” Their eyes told me the stories of the pain that we shared, the pain that only a woman who has carried a child – and lost it – could know. For some, it was fresh pain. For others, it was dulled by healthy babies since born. It’s a silent group, this new club of which I have recently become a reluctant member. Our membership cards are the scars we will always carry on our hearts. Our dues are paid in blood and tears. It is a painful initiation, and one never ceases membership. Because one never forgets. Thank you to all the great friends on twitter that have been a huge support for me the last week. Thank you for being there and listening. Thank you to my real life friends that have called or left me messages - your support is greatly appreciated. Thank you most of all to my husband for helping me, supporting me and loving me through this difficult time in our lives. I also want to tell all my friends & family in the US - Happy Thanksgiving! If you haven't planned your menu yet for the holiday; get to it! You'll need to get your turkey fresh if you wait much longer. And speaking of turkey don't forget to put it in the fridge to thaw if you already purchased yours. Hope you all have a great week, enjoy your family and use up those leftovers! About a month ago I went to a local craft fair and purchased a couple of bars of handcrafted soaps from Creative Wanderings. Oh. My. Gosh. These are the most amazing soaps I have ever tried. I've always been a fan of handcrafted soaps; mainly because I don't find them to be nearly as harsh on my skin as conventional soaps. These soaps were absolutely amazing though. They left my skin so moisturized that I didn't need to use a separate moisturizer and the smell - well it was all I could do not to eat the bars. Even my big kids made comments about how good they smell, and they are always wanting to use this soap over the other soaps in the bathroom. Creative Wanderings is located in Kingston, Nova Scotia. 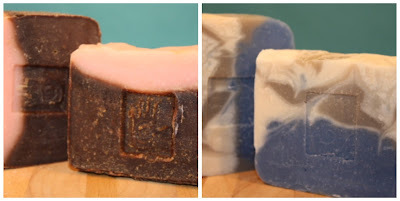 All of the Creative Wanderings soaps are hand crafted using the cold process method, which retains all the naturally-occurring glycerin of the saponification process. The oils that she uses are all vegetable based, so vegetarians can feel comfortable knowing that no animal fats are present. Yay! for vegan soap!! The first soap that we used was called Sugar Rush. It was absolutely amazing. The soap smelled like a mixture of cotton candy and vanilla cake. Every time I took a shower and used this soap I couldn't help but feel happy. The soap is made from all natural vanilla and it lathers up brown. At first I thought it was going to stain my wash cloths but it didn't. :) Last night Miss. Bean told me the next time I buy this soap I should buy 12 of them. I guess she's as sad as I am that it is all gone. The second bar that we used was called Jack Frost. I bought this soap because it reminded me of how Christmas and winter smell. It is made from a blend of eucalyptus, peppermint, and spruce. This soap actually left my body feeling all tingly and refreshed. I really loved using this soap when my sinuses were bothering me or if I had a headache - it actually helped relieve the symptoms. I think I want to stock up on this soap to use in the summer months, because of how it made me feel cool. I bet it would be great on a hot, summer night before going to bed. Creative Wanderings is going to be at the Acadia & Somerset Christmas Craft Fairs tomorrow, November 21st. If you are a local, looking for some great handmade soaps for yourself or for a gift; I encourage you to head over to one of the fairs and support by purchasing local and handmade. I'm happy to share with my Canadian friends, the Snack Pack Share a Smile Campaign and I hope you'll help them reach their goal of raising $20,000 for Food Banks Canada in time for the holidays! Each and every day adults and children alike go hungry and the holidays are no exception. 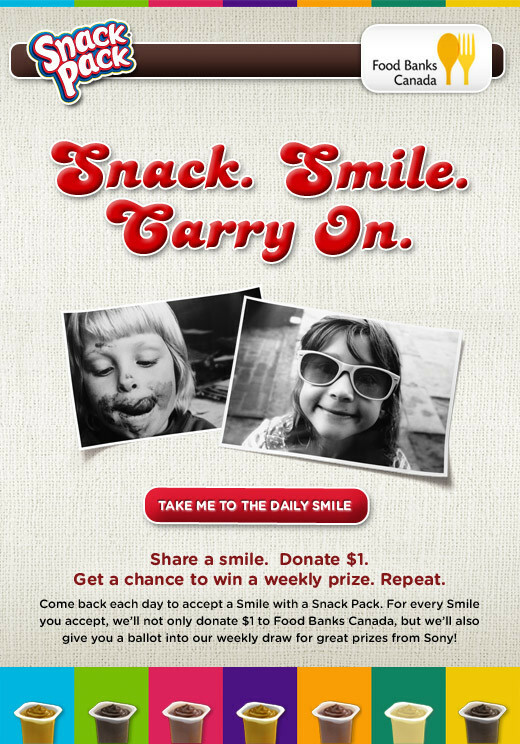 That’s why Snack Pack has teamed up with Food Banks Canada for their Share a Smile campaign. You can log onto their Facebook page for all the details but here’s the gist of the program: Each and every time you share a smile with a friend, Snack Pack will donate $1 to Food Banks Canada. If that wasn’t enough, you are also entered to win a great weekly prize. Now that is something we can all smile about. I thought this was a great campaign because who doesn't like pudding? Snack Packs are a special treat in our house and the kids get very excited when they see I've bought pack for the family. And chocolate grins are pretty cute every now and then. :) I also thought this was a great campaign because Snack Pack is donating money to Food Banks Canada. This is important to me, because rather than donating a treat the money donated will allow the food banks to buy fresh foods for families in need. 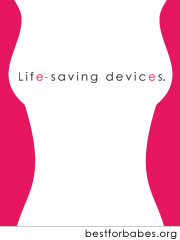 I hope that you'll take the time to check out this link and share a smile for a great cause. A $1 donation will be made on your behalf to, Food Banks Canada. You can also opt to Share a Smile and Snack Pack will make the donation on behalf of one of your Facebook friends. PLUS You’ll earn a point towards one of the fun Smile badges! Remember, the more often you smile, the more donations, ballots and badge points you’ll collect. It’s no surprise that Smiling everyday would have its perks. Disclosure - I am participating in the Snack Pack program by Mom Central on behalf of Conagra Foods Canada. I received a gift card as a thank you for my participation. The opinions on this blog are my own. I don't know about you but in our house it seems the kids are always on one of the computers. I've always had access to their usernames and passwords and they know that I check history, cookies and all of that. 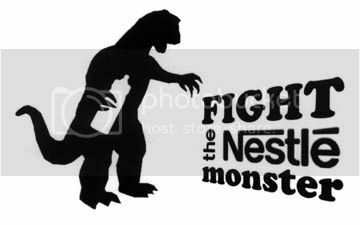 But lately we've been having some issues with cyber bullying and while I want my kids to tell me who is doing it, they seem to have a fear of saying who it is (fear of retaliation?). So I went in search of a way to monitor Facebook chats specifically. I came across the McGruff SafeGuard. McGruff SafeGuard is a permanently free service. • Installs on your child's PC one time. Then, monitor remotely forever. • No need to sneak back onto your child's PC. I signed up and installed the program in less than 10 minutes. I am really relieved now that I can see exactly what my kids are doing online. Of course I will be telling my children that I have installed this program and when I find inappropriate online behavior or I see cyber bullying I can have an open discussion with my children. If you would like to install McGruff SafeGuard on your computers, go here and please use Friend Code 99091 when you get the referral screen. The Great BlissDom Conference Package Giveaway! The One2One Network is having a HUGE and amazing giveaway. They are giving away three(!) prize packages to Blissdom'11! I told you it was amazing! GRAND Prize: Full conference pass (includes Wisdom Workshops), 3 nights at the Opryland Hotel, AND airfare/travel to the conference (up to $500)!!! A $1500 value! FIRST Prize: Full conference pass (includes Wisdom Workshops), 2 nights at the Opryland Hotel!! An $800 value! SECOND Prize: Full conference pass (includes Wisdom Workshops) A $500 value! I have never been to a blogging conference but every time one is held I wish I was there. Learning, meeting new friends, just experiencing it all. At this point, I don't feel I can take money from the family budget to go to a blogging conference but if I won a chance to go I would be absolutely thrilled! Cross your fingers and your toes that I'll win. :) And if you would like your own chance to win, go enter now! Winners have been chosen by Random.org and they have been notified. When I hear back from all the winners I will post the information here. Congratulations! Maggie’s Soap Nuts are the dried fruit of the Chinese Soapberry Tree (Sapindus mukorrosi), related to the lychee and rambutan. The Soap Nuts are harvested in Indian and Indonesian jungles. The Soap Nuts fall to the ground where they are collected by local folks who have used them for centuries. I've done a review of soap nuts before, so when Maggie's Pure Land contacted me about doing a review I really didn't expect it to much different than other soap nuts I have used. Boy, was I wrong! They sent me two products to try. They sent me a box of Soap Nuts and a bottle of the liquid Lavender Tea Tree Soap. First thing I noticed was these soap nuts were far different than the other soap nuts I tried. They were better! All of the soap nuts were whole, no little pieces in the package. Just put 2 of these Soap Nuts in the cloth bag (included with your Soap Nuts) and toss it in the washer with your clothes. That's it! You don't have to worry about taking it out during the rinse cycle because Soap Nuts are non-sudsing; any little bit of saponin left in the rinse adds softness and body to your clothes - so you don't need to use a fabric softener. They work amazing! They cleaned my clothes incredibly well and everything smells so fresh and clean - not heavily perfumed like with regular laundry detergents. Then I tried the liquied lavender tea tree soap. Oh my gosh. I am in love with this laundry soap. I love how it's already in the liquid form to use (you can also boil the soap nuts and make your own liquid soap for cleaning, laundry and body use). What I really loved was the scent. It smelled so good. It's very lightly scented; which is perfect for me as I am sensitive to smells. You only need to use 1/8 of a cup of the liquid for a full load of clothes! I love washing the sheets with this and hanging them on the line - so nice! Also, Soap Nuts & the liquid are safe to use in any machine. This company is committed to providing you with the most natural products available, providing fair wages to workers, and protecting our animal friends by never testing on them. They also donate 10% of their net proceeds to groups that improve the lives of mothers, children, and support a happy, Pure Planet Earth. And it gets better! Maggie's strives to help normalize breastfeeding! Take a look at their flyer that they distribute to stores with their product - don't you love it!? This was the biggest reason that I wanted to do this review. 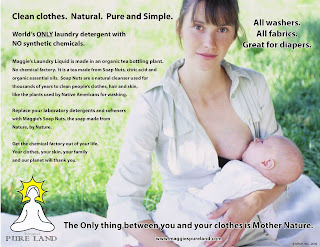 As a breastfeeding mother and a lactivist, I was very eager to share these products and this company with you. I think this is a huge and positive step for normalizing breastfeeding. It says a lot about their philosophy that they are eager to support breastfeeding and I am more than happy to support their company. 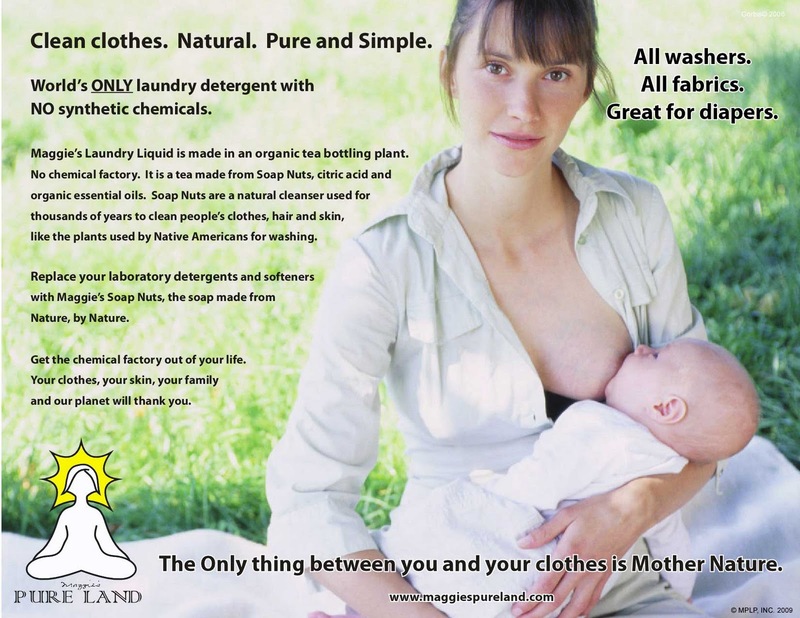 I hope you will support them as well and let others know about this great, eco-friendly, breastfeeding supportive company. Maggies Pure Land has generously offered to sponsor a giveaway to three readers. You will win your choice of an 8 load sample of the lavender tea tree liquid detergent, or a 5 load sample of the Soap Nut shells! Head over to Maggie's Pure Land and tell me one thing you learned about the company. Leave a comment for each entry. You must leave your email in your comments so that I can contact you. This giveaway is open to US and Canada! Giveaway will end November 19, 2010 at 10:00 pm EST. The winners will be chosen by random.org and will be notified by email. I will announce the winner at the top of this post as well. You must contact me within 48 hours. If you fail to claim your prize, a new winner will be chosen by random.org and emailed. My giveaways are also now going to be listed on Giveaway Scout. It's a great website if you host giveaways. They publish giveaways on multiple channels (Web site, newsletter, Twitter, Facebook and widget network) I've been using the site for awhile now to find giveaways and thought I would start using it to promote my giveaways as well.